Today members of Code Green have released footage of a diseased Tasmanian devil found within the area known as The Tarkine. The group has been deploying remote sensor cameras in the area to survey presence of threatened species as part of their ongoing biodiversity studies in proposed mining areas. Field Veterinary Officer Dr. Colette Harmsen looked at the footage today collected by Code Green and said that “the lesion on the devil’s face looked very suspiciously like DFTD but histopathology was the only way to be absolutely certain”. Members of the group are extremely concerned that the discovery of DFTD in the Tarkine means that every process that increases the rate of contact between devils in the area will increase the rate of spread of disease. “Any disturbances to habitat in the area such as forestry, road construction and mining ventures will impact severely on this critically endangered species.” said Code Green member Jared Irwin. “We need the state and federal governments to prioritise the immediate cessation of habitat degradation in the area to give the devils the best chance to survive in the wild.” he said. Released footage of a diseased Tasmanian devil in an area of the Tarkine earmarked for mining development shows there is an urgent need for federal government intervention before the devil slides into extinction, Australian Greens Deputy Leader, Christine Milne said today. “The diseased devil was picked up on remote imaging equipment placed on a proposed Venture Minerals mining site in the Tarkine well beyond where the devil facial tumour had last been verified. “This will spell disaster for the devil if the government signs off on increased mining in the region, meaning facial tumour disease will be fast tracked to parts of the Tarkine still with healthy populations. “It is vital now that the Government intervenes with an immediate halt on further development within the Tarkine. 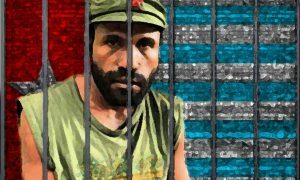 “Tony Burke can no longer delay when this evidence paints in black and white the necessity for immediate action. “With the Tarkine devil population now under threat, protection from development is a must as the chance of this population surviving facial tumour disease relies now on minimising other impacts on the region. “Disease in the area means every single activity that leads to increased contact between devils, such as roads being used more frequently and increased feeding around roadkill, will lead to an explosion of the disease throughout the Tarkine. “Why is it that Minister Burke’s department, with money and resources readily available, are frequently the last to hear of the dire situation facing the devil? It should not be up to environmental groups to inform the public when the government is charged with assessing the potential impacts of mining within the region. “The Minister’s current lackadaisical approach to determining the impact of mining the region will no longer be tolerated by Tasmanians as they associate government delay and inaction with a willingness to sign off on the extinction of the devil. Tarkine National Coalition has described the discovery of Tasmanian devil facial tumour disease at Mt Lindsay in the Tarkine as a tragedy. “The Tarkine has been for a number of years the last bastion of disease free devils, and news that the disease has been found in the south eastern zone of the Tarkine is devastating news”, said Tarkine National Coalition spokesperson Scott Jordan. “It is now urgent that the federal and state governments step up and take immediate action to prevent any factors that may exacerbate or accelerate the transmission of this disease to the remaining healthy populations in the Tarkine”. The Tasmanian Greens today said that the latest discovery of diseased Tasmanian devils inside the Tarkine was a tragedy, and gave added urgency to the need to protect the area from further environmental damage. Greens Member for Braddon Paul O’Halloran MP said that the discovery should be wake up call about the need to protect the Tarkine from environmental threats that could hasten the spread of the disease. “It’s a terrible tragedy to discover that the facial tumour disease has infiltrated what was the last disease-free refuge for Tasmanian devils,” Mr O’Halloran said. I have been offline this week doing fieldwork. Re #6 for an example see post 6 at http://oldtt.pixelkey.biz/index.php?/article/devil-disease-hope/ . My understanding is that Dr Randy Rose (who has (unless there’s an imposter!) posted under his full name to TT on other similar threads) is the author of that post and it gives one reason for my view. Diseases can kill large proportions of affected specimens initially, but eventually species find ways around them. Resistance develops through natural selection, the species becomes rare enough that the disease can no longer effectively spread, or an equilibrium is reached in which the disease still kills some animals in a less dense population but only at a rate fast enough to counter-balance what would otherwise be natural increase. Another is that there is simply no known empirical precedent for a widespread and relatively successful and disturbance-hardy species to become extinct as a result of a disease alone or as the primary cause. When disease is a reason for a species’ extinction it appears either as one of a cocktail of causes operating together, or as the final straw for a species already on the way out. A third is that after what may well be close to 20 years of this disease, even in the hardest-hit area there is no known evidence of substantial local extinctions caused by it. As for the suggestion of habitat loss as a second cause, I see no reason to take it seriously, since before the disease struck, devils were booming despite habitat “loss” (which in some cases was probably advantaging them) and often thriving in very disturbed areas. The contribution of new logging and mining roads to DFTD spread in the Tarkine is likely to be trivial as there are already major existing roading networks in many parts of the area. Habitat loss is also likely to be trivial in terms of the habitat available to the species, and as I’ve pointed out on other threads, for all we know (which in the case of the disturbance ecology of this disease is very little) if devil habitat is really being fragmented that might even slow the disease’s spread. Yes I saw the pictures, but horrific as they were the number of animals known to be involved was small and such issues can be addressed through appropriate regulation and design changes and are not a strong argument against mining/exploration in themselves. Furthermore there is an obvious difference between a narrow shaft and an open cut mine, and it is precisely the small size of the former that was causing devil deaths through jamming. I am, at best, no more in a position to examine what everyone you know in the program said to you, than you are to examine Randy’s reported comment about a claim by Prof MacCullum. But reading all the published research it is already clear that there is at least one area where devil disease has had relatively little impact thus far despite being present for some time. Since the number of regions studied with the same amount of detail is relatively small, it is very unlikely that will prove an isolated case. The Government can’t contain this transmissible cancer because the processes for its spread are now dictated largely by the devil population itself, aided & abetted by our land management & use practices. 1080 poisoning of browsing native animals (Tasmania’s “killing fields” of dead flesh) and road kill assist the movement of devils from one area to another and allow for localised higher densities of devils attracted by the carrion. DPIPWE want to release devils on Maria Island as a cancer-free population (and hope that no one introduces a infectious facial cancer devil to the island!) – Wybalenna for devils. After nearly 10 years of humming and aaahhhing they also want to fence off the north west tip of Tasmania (part of the ‘Woolnorth’ VDL Co. property) to act as a cancer free mainland haven. In 2012 that strategy might be a little late as devils freely move from west to east and back along the coast; in and out of populations where cancerous devils are known. A facial cancer devil was recently photographed in the Tarkine. This transmissible cancer has also been managed as a political disease; one that has attracted many scientists, all but a few closely vetted by the State Government! From 2003 to now money and politics has effectively controlled the science (and the scientist players) involved in understanding this extra-ordinary transmissible cancer. You needed a ticket to ride on the DFTD magical mystery tour! I’m inclined to agree with Dr Kevin in this instance … the devil, as a species, is unlikely to go extinct as a result of this cancer, but like so many Taz-manian stories – the devil is always in the detail. Nothing new there. The case definition of this cancer indicates its spread is determined by both density-dependent and frequency-dependent factors. Movement of cancerous, and more importantly â€˜infectiousâ€™ devils, into unaffected populations is a critical part of the understanding of the dynamics of this cancer. Devils can survive with large facial cancers for many months as infected and non-infectious animals or as infectious animals. The entry and then spread of the cancer into free-ranging populations of devils is determined by actual biting interactions between an â€˜infectiousâ€™ cancerous devil and other devils. The opportunity for such interactions that bring about the inoculation of live cancer cells via a fresh tooth-bite wound occurs around food (carrion availability) and potentially at mating time (competition for females). This is exemplified in the cancers spread in the recorded high-density populations of the eastern half of Tasmania. In lower-density devil populations – animal-to-animal interactions that produce a higher frequency of such competitive behaviours will determine whether any individual devil becomes â€˜infectedâ€™ with this neoplastic Schwann cell-line and then the progression of the cancer through those newly-exposed populations. 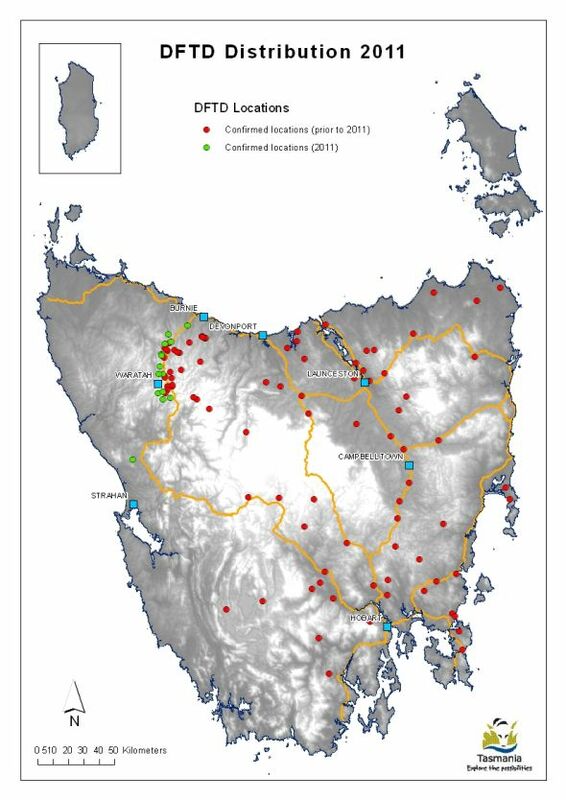 The detection of a devil with a facial lesion visually consistent with the transmissible Schwann cell sarcoma through camera placement in the Tarkine is new information provided by a non-Government organisation – Code Green. The case definition of this cancer indicates its spread is determined by both density-dependent and frequency-dependent factors. Movement of cancerous, and more importantly ‘infectious’ devils, into unaffected populations is a critical part of the understanding of the dynamics of this cancer. Devils can survive with large facial cancers for many months as infected and non-fectios animals or as infectious animals. The entry and then spread of the cancer into free-ranging populations of devils is determined by actual biting interactions between an ‘infectious’ cancerous devil and other devils. The opportunity for such interactions that bring about the inoculation of live cancer cells via a fresh tooth-bite wound occurs around food (carrion availability) and potentially at mating time (competition for females). This is exemplified in the cancers spread in the recorded high-density populations of the eastern half of Tasmania. In lower-density devil populations – animal-to-animal interactions that produce a higher frequency of such competitive behaviours will determine whether any individual devil becomes ‘infected’ with this neoplastic ofhwann cell and then the progression of the cancer through those newly-exposed populations. The story that remains to be told is the drivers in Tasmania’s terrestrial ecologies that has caused this species carrion-feeding marsupial to increase firstly to such high densities by the early to mid 1990s and their potentially acquired aggression when they compete for mates and food. Political science and Biological science rarely agree with each other. 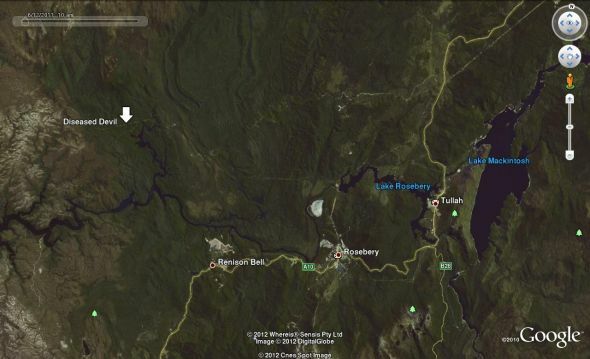 That little red dot south of Deloraine on the Lakes Highway indicates the presence of Facial Tumour Disease Free Devils on or adjacent to Coupe BA388D and the Liffey Falls WHA. Completely being ignored by the Premier, Minister Green, Minister Wightman and the FT/FPA! Interesting that the CFPO has now admitted that FT’s current practices do not meet scientifically based requirements for the protection of threatened species. Really? The disease has already killed off 65% of the entire devil population, and in some areas 90%. And yet you don’t think it’s a big threat to the species? Of course it is, along with loss of habitat (which the State Government is refusing to take seriously). I’m curious as to who this Tasmanian mammalogist you refer to is and what exactly he/she is saying, because it certainly contradicts what everyone I know involved in the Save the Tasmanian Devil Program is saying. The argument that the Tarkine should be protected does not and should not hinge on whether or not it is a disease-free area – in either case, increased mining development and forestry activity will damage/destroy habitat and enable DFTD to make inroads. I assume you saw the horrific photos of dead devils stuck in mining drill shafts. Exactly how would they be expected to survive if more of these go in and open-cut mines are developed in the Tarkine? The author of #4 has completely misunderstood #2. I am hopeful that sometime soon the TT Code of Conduct will include a prohibition on wanton strawmanning so that posts like #4 can be deleted and save us all some time. Most of #2 was not actually about the disease itself, an exception being the comment “I donâ€™t believe DFTD is anywhere near as big a threat to the species as the Greens think it is”, a belief that, for what it is worth, has also been backed on these pages by at least one eminent Tasmanian mammalogist. Furthermore, my comment about the uselessness of certain conservation proposals clearly related not to the work of “The scientists around the world who are investigating DFTD”, but to the proposals of activists and Green politicians concerning the Tarkine. On the whole my point was about the nature of political arguing tactics, and how the devil issue is being artificially presented as an argument in favour of stopping development in the Tarkine by people whose minds about the Tarkine were made up decades before DFTD snarled into view. It is especially cynical of those concerned to have banged on about the Tarkine being the last DFTD-free refuge and then, their stated pretext for saving the area having evaporated before their own eyes (as I predicted it would sooner or later), to simply refashion the new claimed reality into another argument for “saving” the Tarkine. If DFTD-free status was really much of a conservation argument then the correct approach to the Tarkine losing that status would be to switch focus to other areas (oh yes they do exist!) in which the disease had not yet been recorded. As my #2 obviously failed to live up to expectations in terms of lines that might be even half-convincingly misused to portray me as supporting development in the area, I am very glad to rectify the balance. I propose that Minister Burke take a leaf out of the LegCo book and announce he will approve one open-cut mine per month until the Greens and activists stop their DFTD beatup and move on to better arguments about the area. 🙂 Mr Hayward can demonstrate the same superb exegetic skills on show in #4 and explain to TT readers whether or not this proposal is actually serious. The scientists around the world who are investigating DFTD seem to be unaware of the breakthrough knowledge offered by #2 above. Despite lacking any apparent expertise regarding the disease, he is sharing, at no charge, his intuition that all their work, and perhaps the devil itself are, if not useless, at least subordinate to the work of the smash-n-grab industries. Perhaps, Dr Kev, all the healthy devils can hide down the 3″ drill pipes. I had similar thoughts to yours last night but could not form them into anything coherent. Thanks. Ah, so we see an unfalsifiable hypothesis at work. If there are no diseased devils in the Tarkine then activists and Greens say it must be protected to protect against the spread of disease. On the other hand if there are diseased devils in the Tarkine then it must also be protected to protect against the spread of disease. Perhaps if/when there are diseased devils all over the Tarkine we will be hearing it must be protected to avoid disturbance that might drive the devils into less diseased areas! And if all the devils in the Tarkine die then it will be claimed the area must be protected as a place to reintroduce them to. It’s amusing that Christine Milne, who is so happy to accuse others of telling lies (as is her leader), continues to push the repeatedly discredited furphy of the Tarkine having had special status as the last DFTD free stronghold. I don’t believe DFTD is anywhere near as big a threat to the species as the Greens think it is. But even if it was, what they’re proposing would be “bows and arrows against the lightning” anyway. Indeed, if the disease does spread naturally through the Tarkine then that is likely to play into the hands of those supporting development in the region, as they can point out that by far the most heatedly raised argument against development is no longer valid. We can only hope to slow the disease’s progress. In the meanwhile, we should be trying to place as many disease-free individuals as possible on off-shore islands or on the mainland, where they persisted until 4-500 years ago. With a policy so inexplicably stupid, one can’t help remember when a feted owner one of the captive breeding facilities was discovered selling devils to wildlife parks on the mainland not in the captive breeding program. The price back then, for animals which actually belonged to the state, was already $5000 apiece. They are rarer all the time.